The SA, or Student Association is the official organization comprised of every student on campus, and very soon, will include YOU! LBS SA is a registered charity and is a separate legal entity from London Business School. 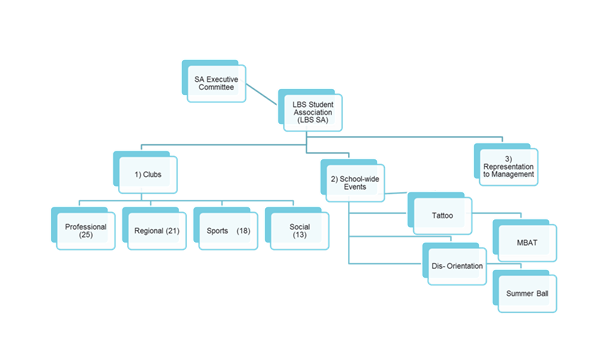 All clubs and student activity is in some way linked to LBS SA, think like divisions of a corporate. Doing all this effectively is a tall order, but like all good b-school students, we’re always up for a challenge. In order to represent your opinions, officers of the SA sit on every committee in the School, to ensure that the student voice is heard. The SA Exec also provide funding, training and co-ordination as additional support to allow student clubs to flourish. Still wondering what it's like to be part of the SA ExCo? We thought as much. Take a look at this video that previous Committee members prepared! We’re excited to welcome you to your new life at LBS, and will be there with you right from Day 1 of your Orientation. In the meantime, if you have questions, opinions or ideas about how we can better serve you this summer, just get in touch! E-mail us anytime at sa@london.edu. The Student Association Executive Committee is the coordinating body of the SA. Elected directly by students in the spring of each year, the ExCo's primary responsibility is to ensure that the SA meets its clearly defined Objectives. The ExCo provides students with an effective channel of communication to represent their interests and concerns with the wider school community. In addition, the ExCo helps to coordinates and supports both Club led and major Student Events on campus. The ExCo also provides students with a unique leadership opportunity. Over 80% of students at the London Business School come outside of the United Kingdom, we come from over 60 countries and speak over 40 languages. ExCo members are committed to representing an extremely diverse and international student population. Your 2018-19 Student Association Executive Committee is headed by Evan Connell. You can get to know the rest of the committee members here. If you are interested in finding out more about the SA, feel free to drop us a line at sa@london.edu.